The Raft is Robie's survival story in the waters of the Pacific. It has all that most stories has like it, sharks, a boat, no water and no food. As well as those, it has adventure, an okay protagonist and a small twist in the story. It does have its flaws, but it's a short book that is a good example of human survival. I'm kinda angry at myself for reading this after the Life of Pi, what a stupid mistake, nothing can compare to that, it was an amazing story/movie. Now I'm gonna do a quick comparison with Pi and Robie. Pi is a selfless hero who gave food and water to help another live, he tried to survive, he wanted to live, and he did, for 227 days. Where as Robie is selfish, greedy, weak protagonist, she didn't try to help Max, and stole his food , didn't share her fish she caight, read his journal and chucked him overboard. I know she was trying to save herself, but it seemed she hardly felt any guilt at all. And when she was on the island, she hardly made an attempt to even save herself. She didn't eat the food when she had the chance, didn't make the effort to catch any (other than on the boat), and she didn't try to find water other than the rain. She just gave up after a week, whereas Pi nearly survive a year. She was a week heroine. It was really confusing with Max. It was real obvious what had happened, and that Robie had gone crazy after a few days. But we really didn't to know about his past, it's not like it would affect the future. And as well, the author didn't make a real effort to learn about him, and if they did want that to be a big part, I think that they should of wrote more journal entries, to strengthen his character. The book was filled with really useless facts about marine life. Robie should of focused more on her survival than naming and cataloging nature. She spent so much time doing so, that she didn't even bother finding food and water, always worried that she might hurt an endangered animal. If she spent another day on the island she would of died, because she refused to survive. The Raft is a good survival story that doesn't have any gory details, or very strong characters, and is a light and easy read. 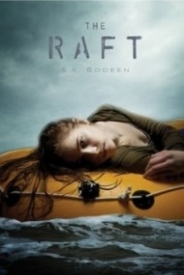 Initially intrigued by the undertaking that S.A. Bodeen tackled, that of making floating at sea in a dingy not only interesting, but suspenseful, I have to admit that I was pleasantly surprised by The Raft. While not without it's flaws - a selfish, monotone protagonist and a not-so-surprising twist ending - The Raft was a quick and entertaining read. Robie was not an easy protagonist to like. A little younger than most YA protagonist's I read about, at fifteen Robie was quite immature. Knowing her best chance of survival is to lessen the weight in the raft, she decides to toss an unconscious Max overboard, leaving him tied behind the raft in a lifejacket to float along behind her. This is after she goes through his personal belongings and eats half of his Skittles. Later, we watch her catch and eat a fish, without bothering to try and wake up Max to offer him some before it spoiled in the sun's heat. She feels pangs of guilt over her actions, but justifies them as part of her quest for survival. So while I can mostly understand her reasoning, I had a hard time relating to her decisions. She was also quite a monotone protagonist, with understated reactions to extreme situations being the norm. Unless she was concerned about a tiger shark attack, not much fazed her. She remarked on her surroundings and chances of survival with an almost calculated apathy, and Max's declining health was of little consequence. Further, much of Robie's time spent floating at sea was passed with seemingly endless facts about the surrounding marine life - what types of fish were toxic, why coral reef was so deadly, the mating and migrating habits of the Albatross, the penalty of interfering with a near-extinct type of seal, and the list goes on. While a part of me found the random facts to be interesting, there was also a part of me that had to fight against skipping whole paragraphs of dull and useless information. Max's role in The Raft was haphazard and scattered, with him regaining consciousness for brief periods where he would continue to share his life's story. He was conveniently conscious when Robie needed a push to do something, or when she was feeling the most lonely. He was never really developed as a character, and so I had little sympathy for him or his past. Even though the majority of the book is spent in a raft, Bodeen's pacing was spot-on, allowing for a suspenseful read. I waited for the next obstacle for Robie to overcome with bated breath, always questioning if the next obstacle would be her undoing. I enjoyed seeing the depths to which Robie was able to push herself - both mentally and physically - in order to survive, and her quick-thinking saved her life in several situations. But with The Raft's ending came a "shocking" twist that revealed a truth about Robie that was slightly disturbing. Without getting in to spoilers, I'll just say that after almost two weeks at sea, her physical health isn't the only thing that her parents should be worried about! A quick read, I enjoyed The Raft. Robie was not my favourite protagonist, but I watched with an almost morbid fascination as she fought the elements in order to survive. Even though I saw the twist coming, I still enjoyed watching Robie come to terms with its' consequences. If you're looking for a quick and entertaining read, The Raft might be just what you need! Enjoyed this plane crash plot. Does anyone else have any suggestions of more plane crash books? I’ve never read anything like this before and like I said I was so in love with this book! I’ve seen TV shows about plane crashes like this (Lost which she actually talks about in the book) but I’ve never read anything about it so I can truthfully say any plane crashing books are going to be very appealing to me know so you can all thank Bodeen for that! Robie was unlike any other she was definitely a girl at times but at others she was strong and could handle everything on her own even though she didn’t think she could. She had to deal with dehydration, starvation, the pain of an infection from her recently pierced nose. After surviving on her raft for a few days she finally washes up on shore, but this doesn’t make anything better except that she’s on stable land. There was one other character we meet in the book and his name is Alex. He was the co-pilot on the ship and he survived the crash with Robie but he was asleep most of the time because of a head injury from the crash. But anyways in parts during the book he tells Robie about his life in little pieces and then he falls back asleep abruptly. That was one of my favorite parts in the book because it took away from the “OMG is she going to survive?!? !” and made it into a little bit of a relaxing moment. Anyways I give this book 5 out of 5 stars for the balancing amount of Dramatics and relaxing moments! Sometimes that can be hard but Bodeen nailed it! I can’t wait to read more of her books in the future.